Screaming or crying is how Stacey Brown wakes up most nights. 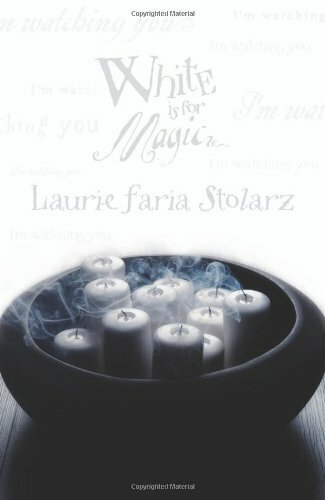 Laurie Faria Stolarz’s, “White is for Magic” grabbed my attention from the first page on. Sometimes I forced myself to put the book down and breath for a minute because it was filled to the brim with plot twists and exciting moments. After Stacey and her boyfriend start fighting she decides to sleep in the lounge room of her dorm building. When she falls asleep she starts hearing someone call her name so she gets up and goes downstairs and then she wakes up back in her bed, finding out it was all just a nightmare. Stacey has had nightmares before, once about the girl she was babysitting and how she was going to die or be kidnapped. Coinsidently the girl died the next day. Another time, she had nightmares about a girl at her school, Veronica Leeman who was going to be killed. The next week she was found dead in the girl’s bathroom. This author’s style of writing is extremely interesting, once you think Stacey’s life is becoming better, something creepy, scary or disgusting happens to the character. In my opinion, the author’s books are very entertaining to read. Laurie Faria Stolarz causes the reader to believe they are living the life of Stacey’s best friends, Amber and Drea, by telling you all of Stacey’s secrets, ideas and fears. When I was reading the book, I felt as if on every page there was another plot twist. This book takes place at a boarding school and it might not be as relatable to some people if they don’t go to boarding school or know what it’s like but it is still a superb novel. In most of the story, Stacey is scared, the tone of the story suspenseful and a little creepy at the same time. If you are not in grades 6 or higher, you shouldn’t read this book because it is a little bit scary.